Welcome to the world of acrostics! 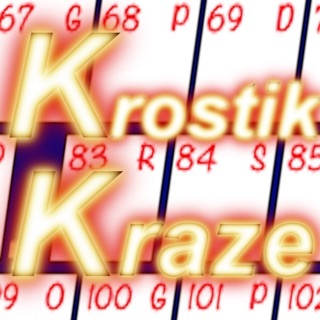 An acrostic, also called a crostic or double crostic, is a cousin of crossword puzzles, with clues and answers whose letters are rearranged to form a quote from a famous (or not-so-famous) author. If you're familiar with acrostics, you will quickly see how convenient they are on the iPhone, because letters are automatically copied to the correct place as you type them in. 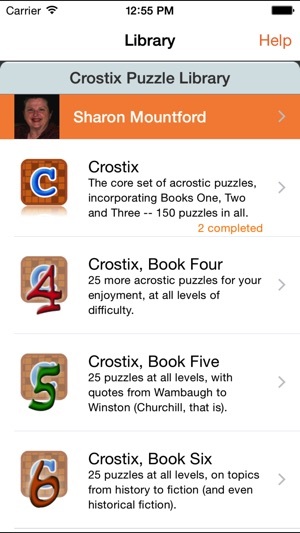 Crostix, the online library of acrostic puzzles, is now available for the iPhone, iPad and iPod Touch. 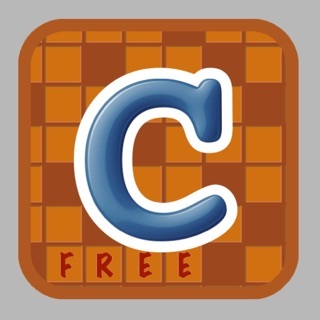 It includes 150 puzzles, from easy to fiendishly hard, and you can buy more puzzles right in the application. 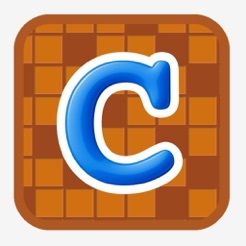 For free sample puzzles, download the aptly-named Crostix Free. 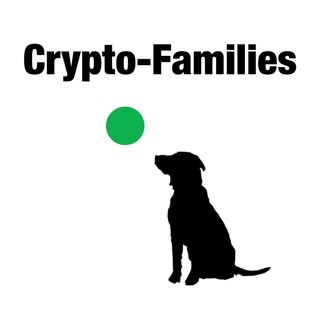 - get help on all program options. If you're new to the world of acrostics, the application also includes a short description to get you started. More tutorials about acrostics are available on our Web site! Three new books! Crostix Books 12 and 13, and a second book of Larry Katzman's Gaglines puzzles. Updated for iOS 10. Unfortunately, that also means you will need at least iOS 8 to run this new version. Our apologies to those using older devices. But most importantly, we hope that this new version fixes the evil and long-standing bug which caused the app to be stuck in "Waiting for Data" mode for new books. Let us know if you still have problems with this; fixing it is our number one priority. This app is great. The puzzles vary in difficulty. The interface is clear and easy to use. There's no timer!! That's really important when you’re constantly picking up and putting down your device. You get to learn all kinds of unusual stuff because, at least for me, I have to research a lot. 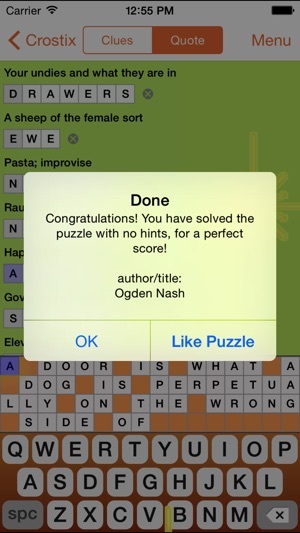 You can work to complete the puzzle, or you can let the app fill in the missing/incorrect pieces. Thank you! I have spent many hours enjoying these puzzles and learning many things I did not know before. I hope that will continue to be additions to the Crostix library as I have completed most of them that are currently available. Overall, way too easy. As mentioned elsewhere, in-app purchases do not all work. Almost a year and this has not been fixed??? Update: Still cannot make in-ap purchases as of Dec 2017. No way to contact the developer. Downgrading to one star, as is totally useless.